Unmoved in Abu Dhabi? Not soon, I won't be - Salut! Done it. After all that whingeing; sleeping on a friend's floor; paying sky-high hotel bills; stepping over sleeping workmen; being told there was never meant to be a door leading to the terrace ("it wasn't on the plans"); hearing a new completion date every month from Nov 2007 to mid-March 2008. And, indeed, after the spectacular triple negative of my headline. At last I have a flat. Or rather, I very soon will have one. No one who has followed my saga of homelessness in Abu Dhabi, a city and country I have grown to like a great deal but also home to some questionable property rental practices, will be surprised to learn that this involves a dramatic change of plan. Instead of Colditz, as someone rather close to Salut! took to calling the flat-that-shall-one-day-be-ready, in honour of its 7/8ft balcony wall, I have found a bright, charming apartment close to the Corniche, a cluster of international hotels with excellent leisure and dining opportunties and a couple of shopping malls. Despite the proximity of all those facilities, the flat is located in a rare leafy area, with loads of parking and, a short walk away, Abu Dhabi's finest public park. Only a bit of finishing off remains before I can start moving in. 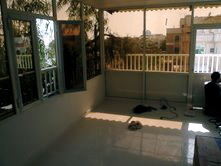 While the flat itself is smaller than I would like, its balcony is roughly 25ft by 10ft, easily big enough to serve as an extra room for the five months of the year that it is not too hot and humid to be out there - and I am sure there are ways of making it bearable for at least part of the blazing summer, too. "May I ask what you expect to see out of a Torquay window? The Sydney Opera House? The Hanging Gardens of Babylon? Herds of wildebeest sweeping majestically..........?" Cannot wait to get in. Mustn't get smug.